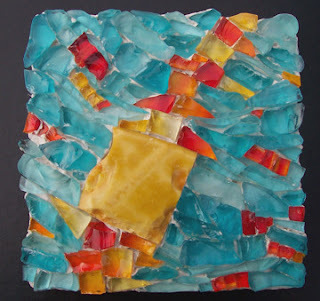 Margo Anton's Mosaic a Day: "New Beginnings"
After a fairly extensive hiatus, I've decided to take up the project again. I learned so much the first time around, plus it really encouraged my ongoing creativity. As well, I finally finished my new studio and teaching space, so this will get me going. A few people should recognize this piece, as I created it in Oakland at the Institute of Mosaic Art when I was teaching there in June. We had so much fun that I've been asked back again for next April, and I'm already looking forward to it.